New movie has been released ''The Goldberg Variation No. 8'', BWV 988, (by J. S. Bach), please check it in the MP3 & Video section. New mp3 from the "Doubleshred" Fool-X trio CD were released. You can download it in the Discography section. Nov 13, 2006 - "Doubleshred" for sale! "Doubleshred" - Debut CD of Fool-X trio is accessible online for sale. Just click Buy Now button. You can pay use secure PayPal system. There is 8 compositions of Adam & Tomasz Fulara, see also the Discography section for more details. TV Show with Fool-X trio from Polish TV ProART (recorded: April 2006) has been released at Google Video service. There is a part of the gig and interview with Fool-X trio members. Adam Fulara was a guest of "Saturday Magazine" in BBC Radio (14 Oct, 2006). There was an interview and short live performance. Here is presspackage of Ards International Guitar Festival, and a review of it in Polish press. New pictures from Polish Guitar Legends Festival called "Solo Zycia" (Lublin 2006) were released. We have also the second gallery here (photos by Jacek Zaim). First Ars Tap-Guitar Festival will be in Germany in October! All details you can find on the Festival webpage. We have three new sets of pictures on our web page: The pictures from Workshops on Guitarfest 2006 Festival (Bratislava, Slovakia), and from Fool-X trio gig on the Festival in Bratislava, and the third set from photo session before release first CD of Fool-X trio. Marek Napiorkowski - famous polish jazz guitar player will be a special guest of JaZZlot 2006 Festival - jazz guitar players meeting and festival in Ostrzeszow. At the moment Fool-X trio finished recording of the debut CD with 8 tracks (own compositions). It will be accessible for few weeks from the web site. There is a new photo gallery from the tapping semminar at Musicology - Wroclaw University. New photos from gig in Odolanow has been released. New photos from gig in Brodnica have been released. There is a new photo gallery from gig of Fool-X in Minsk Mazowiecki. www.adam.fulara.com has over 500 000 visitors since 2002. We have average 1150 visits every day. See also detailed statistics section. 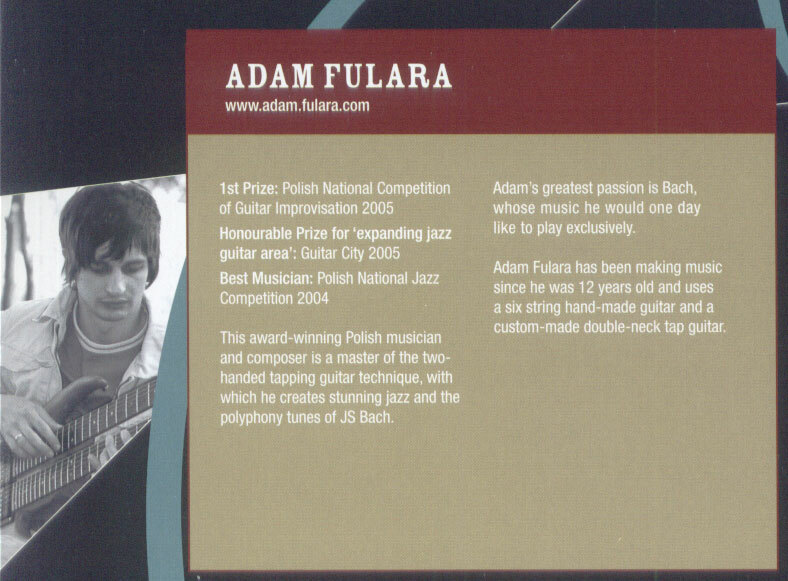 Adam Fulara is the undiscovered of the April / May 2006 in the rank of Guitar Nine Records famous guitar recording label. New photos from National Spring Jazz Festival 2006 has been released in the "Gallery" section. In the "MP3 & Video" section you can find the Second Goldberg Variation Movie BWV 988 (J. S. Bach). Recorded in July, 2005. Select one of these mirrors to see the streaming video: 1, or 2.